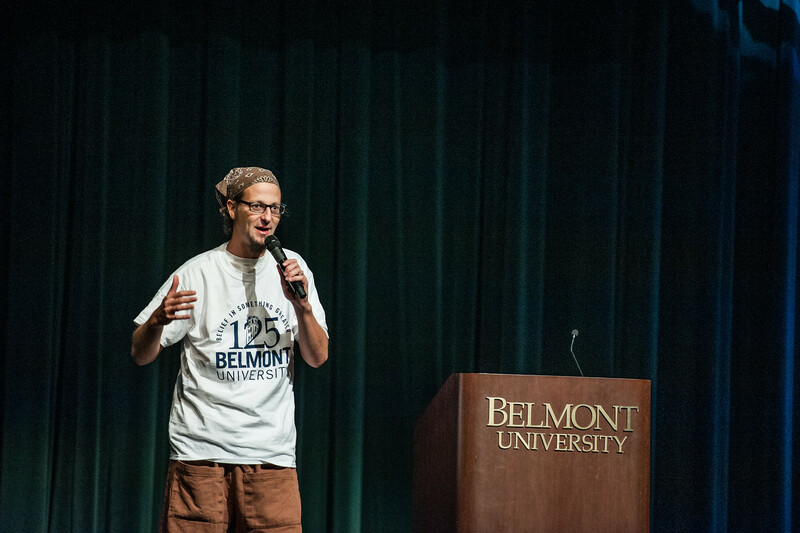 Belmont’s first 2015-2016 chapel, held on Friday, August 28, kicked-off the University’s 125th anniversary celebration, a year of believing in something greater. Author, activist and founder of The Simple Way, a faith community in inner city Philadelphia that has helped birth and connect radical faith communities around the world, Shane Claiborne spoke on the importance of building community in one’s life. He told stories of times in his life that shaped his belief in being around people that challenge him. He also shared a few pieces of advice. First, he instructed students to talk directly to one another, not around or about one another. “Murmuring is poison to a community,” he said. Next, he encouraged willingness to confession, the ability to say sorry and allowing one another to make mistakes. “We can carry each other’s burdens in a society that greatly emphasizes independence,” he said. Claiborne told of a time when a homeless community moved into an old cathedral in Philadelphia. The city issued a law prohibiting people to feed the homeless. One night, more than 100 college students went into the cathedral and prayed over the community. They fought the law on the grounds that it was unconstitutional and succeeded. “We won that victory because there was a community willing to rise up, rooted in our love for Jesus!” he said. Claiborne’s hope is that students will remember the message of the gospel this year, a true belief in something greater than oneself. “Community allows us to walk in hope. On the days it doesn’t feel like the light is winning, we give each other hope,” he said.